The main difference between relational and nonrelational database is that the relational database stores data in tables while the nonrelational database stores data in key-value format, in documents or by some other method without using tables like a relational database. A database is a collection of related data. A Database Management System (DBMS) is a software that helps to store, access and manage data easily. There are various types of databases and relational and nonrelational databases are two of them. Database model defines the logical design and the structure of a database. Also, it defines how the data is stored and accessed using a DBMS. Here, a relational database is based on the relational model. Relational database stores data in tables. A table consists of rows and columns. Where, the rows represent each entity while the columns represent attributes. For example, assume a sales database. The customer table has columns or attributes such as customer_id, name, address, contact_no. Each row in the table represents a single customer. The primary key of the customer table is customer_id. It helps to identify each record separately. Furthermore, assume that there is another table called orders in the sales database. It has order_id, order_name, date, customer_id. The customer_id in the customer table is a foreign key in the order table. Therefore, the two tables are related to each other. In a relational database, the tables are associated with each other. It is possible to normalize the data in tables of the relational database to minimize data redundancy. Furthermore, the Structured Query Language (SQL) helps to query the data in a relational database. A relational database is not effective to store a large amount of data such as BigData. Nonrelational database is a solution to this issue. Furthermore, nonrelational database is also called NoSQL. These databases can store big data. It is also possible to cluster data into several machines to reduces maintenance cost. There are various types of Nonrelational databases. Column databases – Read and write data column wise. This is useful in data analytics. E.g. Apache Cassandra. Key value stored databases – Fast and are not very customizable. E.g. Couchbase Server, Redis. Graph databases – Consist of nodes. Relationships are created using edges. E.g. Oracle NoSQL, Neo4J. Relational database is a database based on the relational model of the data, as proposed by E.F. Codd in 1970. Nonrelational database, on the other hand, is a type of database that provides a mechanism for storing and retrieving data that is modeled in a way other than the tabular relations used in relational databases. Relational databases are also called SQL databases while nonrelatioanl databases are also called NoSQL databases. 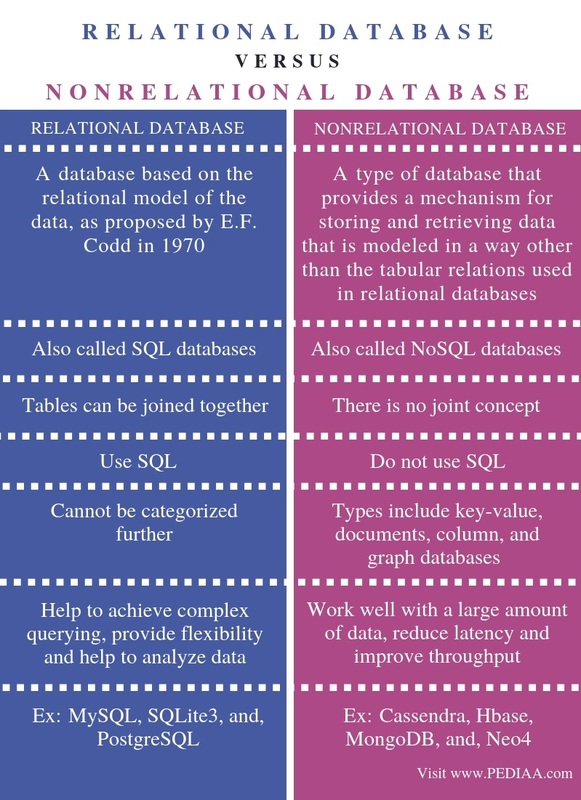 The relational databases use SQL whereas non-relational databases do not use SQL. A difference between relational and nonrelational database is that the tables in a relational database can be joined together. On the other hand, there is no joint concept in nonrelational database. Another difference between relational and nonrelational database is that the relational databases cannot be categorized further. In contrast, key-value, documents, column, and graph databases are the types of nonrelational databases. Relational databases help to achieve complex querying. Moreover, they provide flexibility and help to analyze data. Nonrelational databases work well with a large amount of data. Furthermore, they reduce latency and improve throughput. Hence, this is another difference between relational and nonrelational database. MySQL, SQLite3, and, PostgreSQL are some DBMS that uses relational databases. Cassendra, Hbase, MongoDB, and, Neo4 are some nonrelational databases. 2. “NoSQL.” Wikipedia, Wikimedia Foundation, 23 Oct. 2018, Available here.